La Belle - The Beauty Boutique: Why SPF 15? At last the beautiful sunny weather we have all been waiting for has arrived! We all know that we need to be wearing an SPF to protect us against UVA/UVB especially when we go out in the sun, but what is the difference between an SPF 15 and an SPF 30 or higher? We believe that wearing a higher SPF factor will give us more protection from the sun for longer, when sadly this isn’t the case. Research has shown that we are getting a higher risk of skin cancer because we are relying on higher factors of sun cream, thinking that if we have an SPF 30 or higher on that we don’t need to reapply as often and that we are safe from the sun. When in fact you are more likely to burn as you’re not reapplying as often as you should! An SPF 30 or higher contains higher levels of harmful chemicals such as Organic light-absorbing molecules where it has now been show that UV irradiation turns a number of them into free radicals, thus causing the very thing it’s trying to prevent! 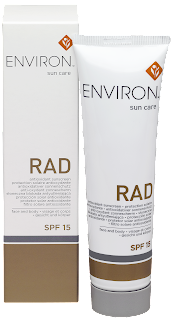 We highly recommend sticking to an SPF 15 and reapplying frequently, we recommend our clients the Environ RAD SPF15 as this can be used on a daily basis and only contains a very small component of organic absorbing molecules, instead Environ RAD contains mostly inert titanium reflectors, and is also loaded with natural antioxidant vitamins that increase sun protection and assist in fighting free radicals. · Apply RAD SPF15 to the face, neck, décolleté and body. · For daily use on all exposed areas of the body as a sun protection. It is wise to reapply this product every two hours when spending long periods of time in the sun. · Suitable for all ages, including babies over age 6 months. · Contains antioxidants, beta-carotene and vitamins C and E.
· Contains Titanium Dioxide only a very small component of organic absorbing molecules.